These facts have been compiled through the Surrey School District website as well as through our contacts within the District. If you are hoping to get your child into French Immersion at Ecole Woodward Hill, based on the proposal, you will be unable. The school will only accept siblings starting September 2017. McLeod Road hosts a Traditional program in our community sitting on 28,225 sq metres of land. The property that McLeod Road sits on has zero portables. This single-track program can accommodate more students from the catchment as it allows intake at every grade level from K – 7. The school currently hosts 212 students. Ecole Woodward Hill is a dual track school sitting on 24,715 sq metres. Ecole Woodward Hill currently has 649 students with 6 portables (1 modular). The school is expecting an addition to open for the school year 2017/2018. In 2012, Cambridge had 16 portables on it's 30,692 sq ft lot and 803 students. This over-extension was to accommodate students that would be going to the new Goldstone Elementary. French Immersion program schools feed into a French Immersion stream high school earning a double Dogwood Certificate. The District is responsible for prioritizing how Provincial funds are used, however, the District is at the mercy of the Province to provide that funding. When a development proposal comes in to The City of Surrey, the area planning department sends out details of the development to the District for their feedback. The District provides their feedback in the form of a report. This report (along with other reports and recommendations) are then put in front of the City Council. After the City Council approve the first pass through of the proposal, you will then see the green development signs pop up in the neighbourhood. The District has no further say in the development process and they are only otherwise engaged every 5 years for neighbourhood planning (which historically is out of date before it is put in place). As of March 7, 2016 there were development proposals for more than 550 units for our neighbourhood. We can only guess the number of proposals that will receive approval let alone the number of children that will be added to our community. The Ministry of Education has different numbers of what constitutes a classroom than the District. For example, according to the Ministry, a Kindergarten class has a capacity of 20, whereas the District states there is room for 22. Being conservative and using the capacity numbers, we were 471 students over our capacity in 2016 for our area (that is 6 schools in a 10 block radius - Hyland, McLeod Rd, Ecole Woodward Hill, Cambridge, Goldstone, and Sullivan. There are portables (temporary relief) and there are modulars (permanent). Portables receive their funding from the operating budget which impacts the schools ability to provide other resources for their students (additional EA's, library resources, equipment, technology, etc.). ​In the Woodward Hill French Immersion Change Impact chart provided by the District, you will see that after they completely eliminate one classroom per grade (2024), they will have gained the space for a total of approximately 160 spaces. Although, the enrollment projection for our area for 2021 will be more than 1431 over capacity. It will take 7 years to gain 160 spaces by reducing the one French Immersion classroom based on the current proposal. ​This is another way to look at the stats above. You will see that removing one French Immersion classroom will have only a small impact on the overall capacity issues by 2021. And note that these are just projected numbers of additional students coming in. The last time they projected the numbers of students in coming years, the District was well-understated. ​This document is key to seeing the projections (potentially understated) of the numbers in the coming years. Reducing the French Immersion is but a drop in the bucket and does not help the overall capacity issues within our neighbourhood. 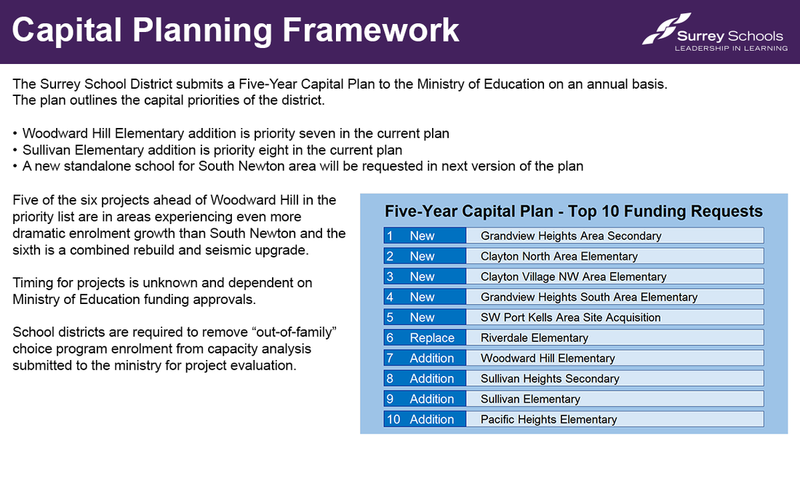 What we need are additions and an additional elementary school. ​It's clear we are low on the list of priorities in comparison to the Grandview and Clayton areas, even though we share similar issues. We need more than just additions to our schools to house the projected students in the coming years. We need another elementary school.